Good morning. It's a beautiful day today, and I've just got home from work a little while ago. Pogo was so excited he was hopping all over me. It surely does make coming home a special event. Well, we survived the rains without getting a cellar full of water, Pogo's babysitter is home from vacation, and all is well in our little world. I have a couple of photos to share. This past Monday morning, before I left work, I looked across to the field and thought I saw some movement way in the back. So I grabbed my camera and took some photos. This first one shows how far it is across to the back of the field. The yellow arrow shows where I spotted the movement. 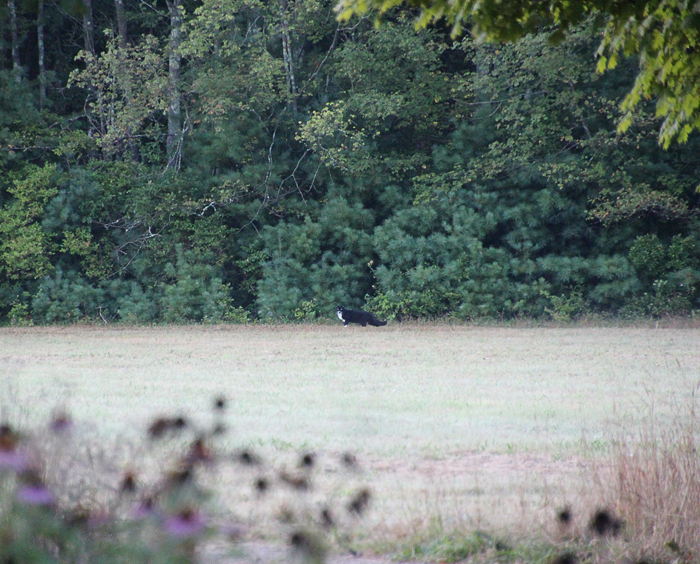 This next photo shows what I saw when I zoomed in on the back field. It was the neighbor's cat out for a walk. Just one reason why I love my Tamron lens. I get to see things that I don't even know are there. All kidding aside, it's a great lens, and usually the only one I carry with me. There's really not much news this morning, and I'm beginning to wilt. Me thinks it's time for a nap. So, on that note, till tomorrow Y'all have a wonderful day. What a beautiful morning it is today! I guess I owe the weatherman an apology. Yesterday around noon time, the rain stopped and the sun did come out. The rest of the day was absolutely lovely. It's supposed to stay nice for the rest of the week. Yesterday was also my grandson Kevin's birthday. He was off having fun celebrating, and I was busy cleaning fleas and dog #&?!. I left Pogo at home alone while I ran out to Walmart to pick up some flea shampoo, and when got home I found that he had decorated the kitchen and pantry floors with dog poop! That's putting it nicely! It took about half an hour to clean up all the mess, and then another half hour to give both Pogo and myself a flea bath. I did not need to climb into the sink because he splashed enough of the water out on to me. In between the clean up and the bath, I vacuumed the carpets and floors and sprayed some flea stuff. Now we should be good for a while. This morning Pogo has been playing with a pink stuffed doggie. It was so cute that I took some photos. I do think he's made a new friend. Today I have to try and figure out how to make my thumb drive writable again. Something has happened to it, and I can't save anything to it. I've already tried everything I know, but so far nothing has worked. I'm hoping that I can transfer what's on it to another drive. Now I think I'll get me dressed and start the day. The washing machine is calling and Janet will be by later so I want to figure out what's for supper. Till tomorrow, Y'all have a wonderful day. Good morning. Well, it rained quite a bit during the night, and then let up this morning just long enough for me to take Pogo outside for his morning sprinkle. Shortly after we got back inside, the thunder started and then the rains came again. The heavy stuff has slowed down for now, and it's just a steady rain. 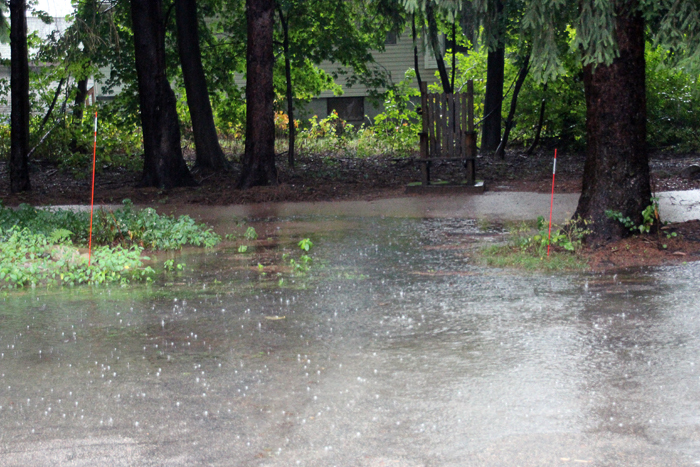 There are flood warnings for Southern Massachusetts, Rhode Island and Connecticut. With one to two inches of rainfall an hour, I can see why. My yard is already flooding. Here are a couple of photos that I just took from my door. These shots show the side yard flooded, and the driveway is now flooding too. 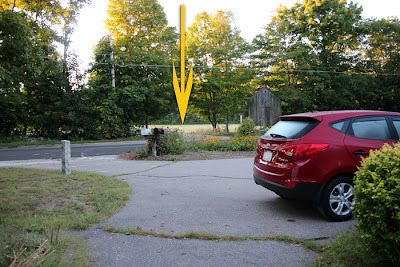 That wagon wheel is in the driveway not far from my car. The weatherman is saying that we have a 6l% chance of rain for today. I wonder just what he has been sniffing? I think maybe he should take a trip outside and maybe revise some of his forecast. lol. They are even showing bits of sunshine possible for today, but I don't see that happening any time soon. All joking aside, I hope none of this water makes it's way into my cellar again. The last time we had flooding cost us a lot. I had recently replaced both the furnace and the hot water heater, and the flooding ruined both of them. It also ruined everything else that was stored in the basement, and weakened some of the walls. It took quite a while to get most everything back into shape. Mind you, I'm not complaining. I'm following the storm Isaac on the TV, and I'll gladly deal with our water situation. The folks in Florida, Louisiana, Mississippi, and Alabama are getting inundated with tons of water and heavy winds. Now I think I'll see about whipping up some breakfast. Pogo has been waiting patiently for me to finish posting. Did I mention that he is afraid of sticks? The other day, I picked up my backscratcher to scratch my back, and Pogo flew off the couch and wouldn't come near me. It took more than half an hour to coax him back up on to the sofa with me. There is a lot of anger in my heart toward his previous owners. Till tomorrow, Y'all try to stay dry and have a good day. Parts 5 & 6 Of "Vintage Garden"
It's three o'clock in the morning, and the Mrs is snoring away while I sit here at the kitchen table, playing on my laptop. I would try to catch a few winks while she is sleeping but she wakes up about once every hour. These newest pills that she is on have really messed up her sleep/awake system. I hope when I get to be 95 that my kids don't fill me up with all sorts of pills. Especially the kind that take away my ability to function. I don't want to be put into a nursing home either. Hmmmm, I think I need to re-write my will. No one gets anything from me if I am in a nursing home. What a great idea. You know, if Congress would stop sending billions and billions of dollars to everyone all over the world, they could use that money to keep us old folks very comfortable in our "golden" years. They could use that money to feed our hungry children, and to build a water pipeline to save our farmers' crops and animals. They could put America back to work, and keep families in their homes. They could do so much. It's so simple. So why don't they? Mrs keeps telling me that I should run for President. Well, considering the fact that Congress does not ask me for my opinion on anything now, what makes her think that any of them would back me if I ran for office. One must have millions of dollars to spread around, and be an expert at lying in order to be a favorite candidate. I don't have the money, and I can't lie my way out of a paper bag. So much for that idea! 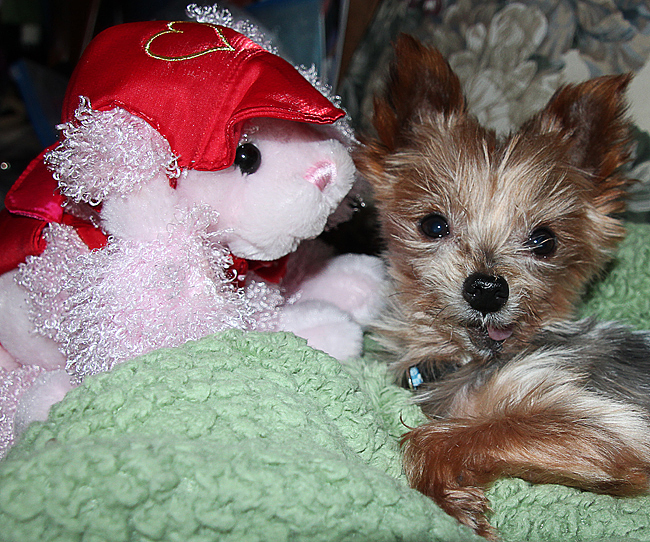 This morning I have the cutest photo of Pogo to share. He was standing up in his car seat with the cutest expression on his face. I just couldn't resist taking some photos. I think this one is simply adorable! Today is also Mandarin Orange Monday, and time for a new piece of photo art. I used two textures on my photo, "Urban" by Kim Klassen and "Dusty Rose Bokeh" from Bonnie at Pixel Dust Photo Art. In Photoshop, I used the "dry brush" filter and the "difference" blending mode. 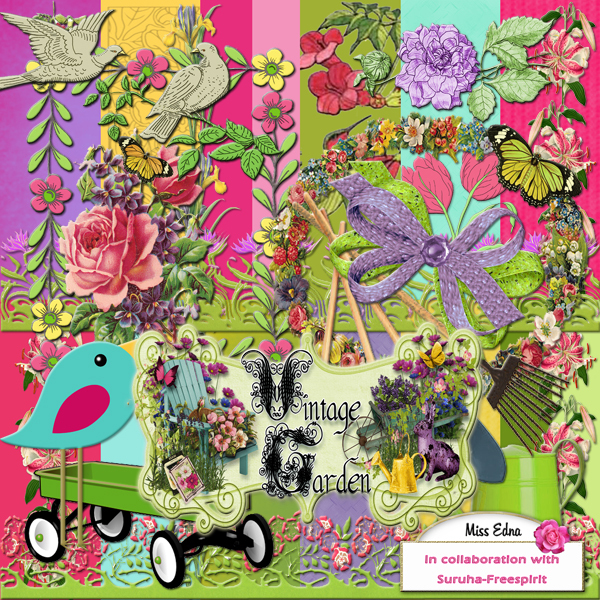 I also have the last two parts of "Vintage Garden" for you. I hope you are enjoying this fun kit. 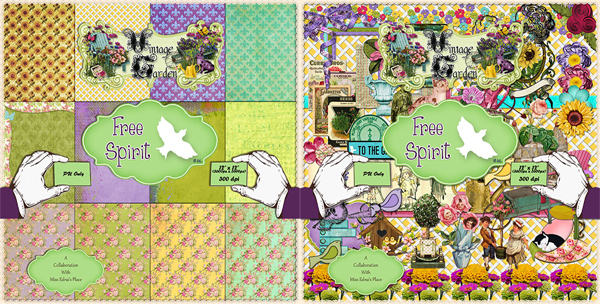 Su and I are already working on the September kit which will be a totally nice surprise for you. But that's all that I can say about that. You'll just have to come back later for it. When you have finished downloading, do hop on over to Su's web site and pick up her last two parts. Please don't forget to take a moment to say thank you. That's it for my morning rambling. It's time to go check on the Mrs. So, till tomorrow, Y'all have a fabulous day. Such a pretty morning we have today. 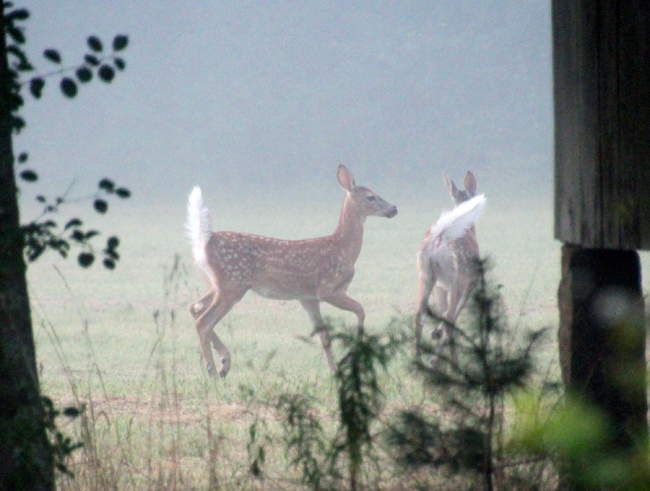 It started off on the cool side with lots of mist rising off the ground. I took Pogo outside for a sprinkle ( I took him to work with me last night) and got quite a nice surprise. 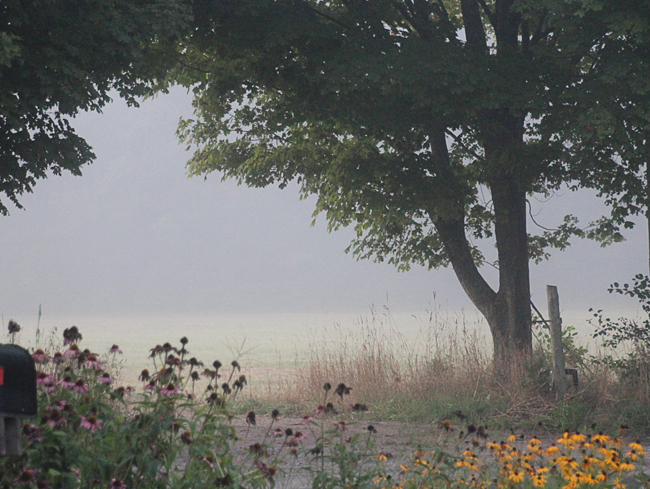 There was a gorgeous mist rising across the street. I went back in and grabbed my camera. Good thing I did. Here's what I got. 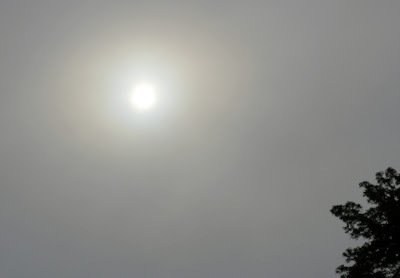 On my way home, the sun came out but was hidden by the heavy mist. This was also quite pretty, so I pulled over to take some photos. This first photo is the sun, and the second photo shows the visibility on the road. 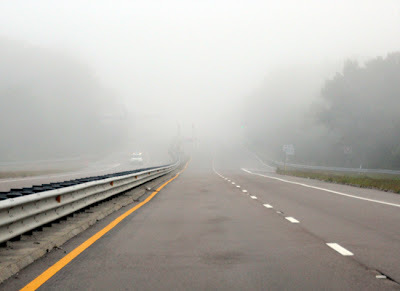 By the time I got home, most of the mist had burned off. Once we got home, Mr. Pogo marched himself into the kitchen and sat there waiting for his breakfast. He's such a sassy fellow. If I don't move fast enough, he starts barking at me to move faster. If I tell him to shut up, he just barks louder. This morning I threatened to beat him with a cooked noodle and he just laughed at me. Imagine! Ah well, we've had our breakfast and my coffee is almost all gone, so I guess it's time for a nap. Tonight is a work night and I need to be bright eyed and bushy tailed. (Now there's a phrase from out of my childhood!) Till tomorrow, Y'all have a wonderful day. Good morning. I'm trying not to say this, but have you checked the date lately? August is rapidly drawing to a close. Now where on earth did this month go? If this keeps up, I'll be an old lady and I won't even know what hit me! I'm finally starting to feel better from the effects of the Pravastatin. This is good because the local Market Basket is having a fantastic sale and there are a few things I would like to get. Yesterday, after work, I stopped at Walmart but I just wasn't in the mood for shopping. I did, however, get a new microwave oven for the dwarfs' kitchen. 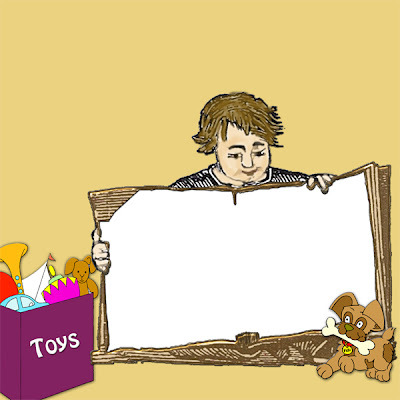 I'm hoping to get an early start to the market this morning and beat the crowds. Later, when I get home, I have a couple of links to check out regarding natural herbs for lowering cholesterol. Thanks, Snowy. There's really not much news today, but I do have a photo to share. 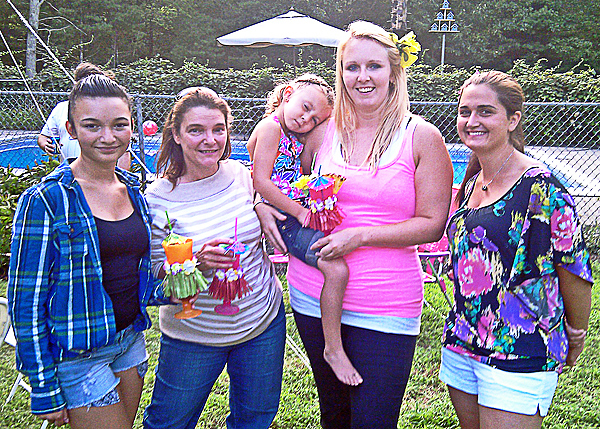 This is some of my girls, and was taken at a get together a few days ago. They are, from left to right,: Jasmine (granddaughter), her Mom, Dee Dee (daughter), Lilah (great granddaughter), her Mom, Randi, and Randi's friend Kerri. Now I'm going to rustle up some scrambled eggs and potatoes. Pogo hasn't been eating so good, and this will get his appetite back. So, till tomorrow, Y'all have a fabulous day. It's quite nice outside this morning. The sun is shining and it's in the 70's. The weatherman is promising temps in the mid 80's for later this morning. We can handle this. I'm at work, so this may not be a very long post. Twenty years ago, someone very dear to me was diagnosed with cancer. Over the past twenty years, she has battled and survived this dread disease three times. Now it's back again. I'm praying that she can beat it a fourth time. This makes me stop to think of all the times I've whined and crabbed. It makes me realize what a gift is to be able to whine and crab. I wonder how many of us have ever given thanks for this gift. I wonder how many of us even thinks of this as a gift. So, next time you're in a crabby mood, lift your eyes and say thank you. I stopped taking the cholesterol medicine the first time the doctor told me to take it because I was sick for two days after I took it. This month, he told me to start taking it again. I did, and was sick for two days. Of course, I stopped it again. Yesterday I gave it another try. Within an hour, I was sick as a dog and back in bed. So that's the end of that medicine. I'll call the doctor Monday, and see if he wants to try something different. Let me share a couple of bird photos that I took last week here at work. This first one was taken through the living room window. Both the sun and the glass have given the photo a lovely textured look. 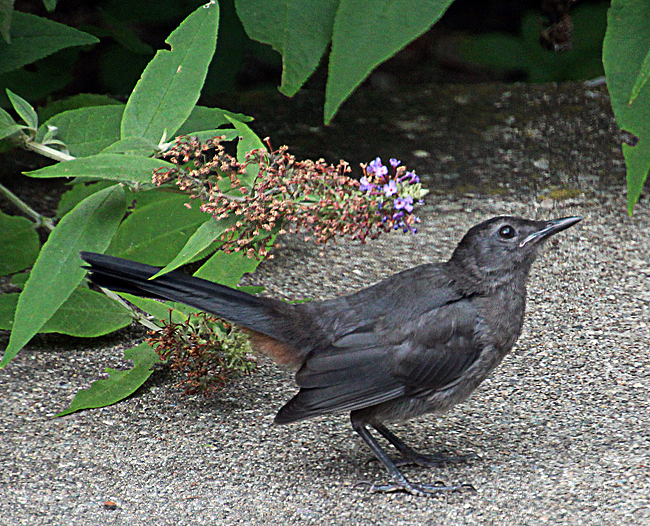 This second photo was taken through the patio doors. 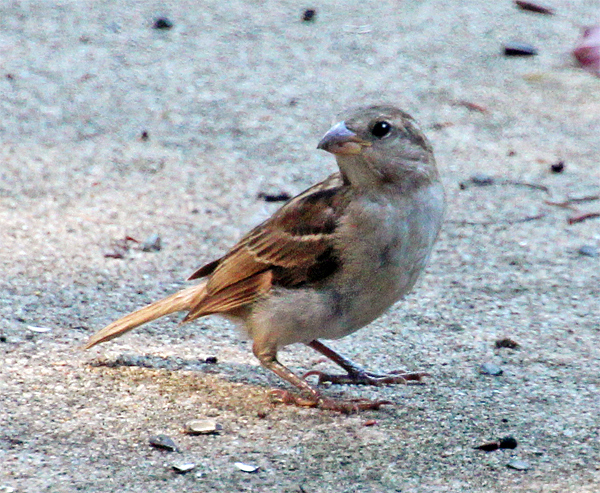 It's one of the many little sparrows that comes to the feeder. Now I must get busy here. Mrs is beginning to stir and will be wanting her breakfast soon. So till tomorrow, Y'all have a wonderful day. It's Good To Not Be Tired! It's another beautiful morning here. And something is working because I actually got a few hours sleep last night, all in a row. Gosh, it surely feels good. I was beginning to get worried about always being so tired that I just wanted to crawl back into bed. I got up a couple of hours ago and still have the energy to do a couple of things around here. 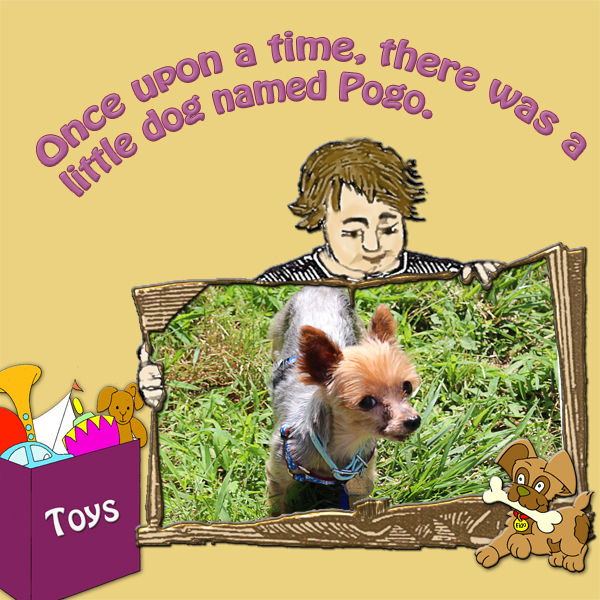 Yesterday, Pogo got a present. Janet's sister sent him a little plaque for the wall (this is for me) and a bag of doggie treats. 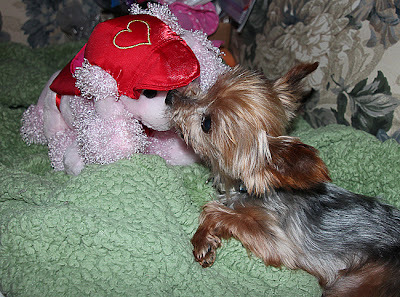 I cut a couple of the treats up into tiny pieces and Pogo had himself a really nice treat. The plaque reads: "Paw Prints And Pet Hair Enhance My Personal Style." Yup! That's me! My little Pogo has wiggled his way into everyone's heart. Even though he is not very cooperative in the potty training department, one can't help but love him. And, he has totally taken over my fuzzy green blanket. As soon as the blanket comes out of the dryer, Pogo can't wait to curl up on it. Here's a photo I just now took of him. How can anyone not love him? 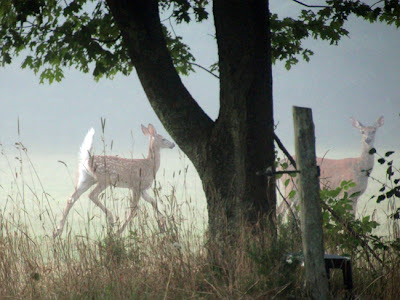 I have some photos to share that I took last Friday morning. I was looking through the screen door, and couldn't believe my luck. There was a hummingbird outside feasting on the evening primrose. 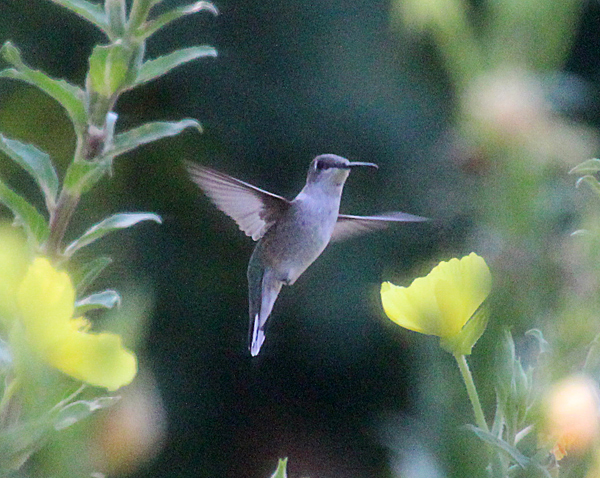 I grabbed my camera and shot these photos through the screen. Opening the door would have alerted the hummingbird to fly away. The first photo is one of the originals. 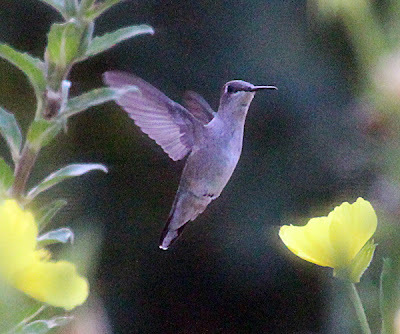 The close-ups have been cropped and tweaked with auto contrast and unsharp mask in Photoshop. Now I want to get dressed and get started on a few things around here. I've been neglecting so many things these past couple of weeks while I've been tired. Gosh, it's good to not feel tired! So, till tomorrow, Y'all have a fabulous day. It's another beautiful morning here in my little part of New England. Pogo and I are watching The Cat In The Hat. PBS has some wonderful programs for both adults and kids. Speaking of kids, Jasmine attended cheerleading camp earlier this month. 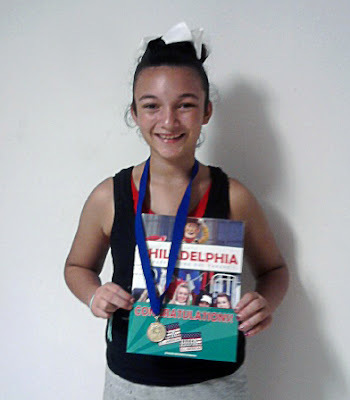 While she was there, she was chosen to participate in the 2012 Philadelphia Thanksgiving Day Parade as an "All American Cheerleader". This is quite an honor for her. I've been reading over the itinerary for the trip, and it sounds absolutely fascinating. Now we just have to see if it's affordable. Here's a photo her mom took with the phone. Something I've noticed is that everybody seems to be taking quite good photos with the camera on their phone. I'm going to have to start practicing using my phone's camera. It looks so easy when others do it, but when I try to take a photo with the phone, I find my hand is rather shaky. In a few minutes here, I need to start cooking. I want to make up some hamburger patties to freeze and put away for Pogo's suppers. Then I need to start the sauce for supper tonight. I think we'll have some form of pasta. At least, that's plan. 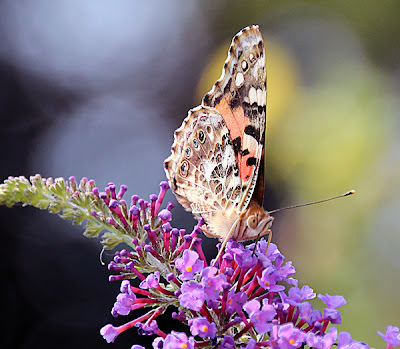 I have a couple of butterfly photos to share with you this morning. These were taken a few days ago at work. I have to share this. The little word animals on television are singing a song in Doo Wop style, and it's making me smile. What a great way to start the day. (I grew up with this kind of music.) Now I think I'll get busy here. Janet will be coming by later and I want to be able to just sit and enjoy her company. So, till tomorrow, Y'all have a wonderful day. Don't Get Me Started On The Game Of Politics! Good morning. It's really quite nice, only 70 degrees at the moment. Later it will get up into the 80's, but for now it is just right for doing errands. 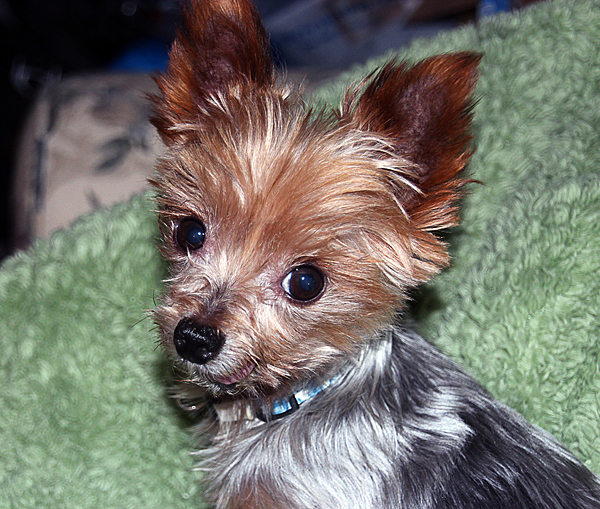 Pogo and I have to go to the post office before my appointment at the nail salon. The news channels have been chatting up a storm lately about the upcoming Democrat and Republican election conventions. Excuse me. But what is the purpose of these conventions? It used to be when each party chose their presidential candidates, but this year's candidates have been chosen for quite some time. We don't need conventions this year to do this. So, is this just another way for government to spend an awful lot of money on fun stuff for the politicians? I am so disgusted with the politics we have in place. What used to be a means of electing the right person for the job has simply become a game where he who has the biggest bag of money wins. Sad, sad, sad. The nasty mud slinging is very wearing too. Why can't individuals running for office do so on their merits alone? Why must we constantly be bombarded with all sorts of nasty accusations? And with so many important issues to be considered, why is it that both parties are in a battle to see which one can totally destroy the medicare system first? I won't even go into this one. I could be ranting for days. How about some photos? I have two that I took a few days ago during a light rain. 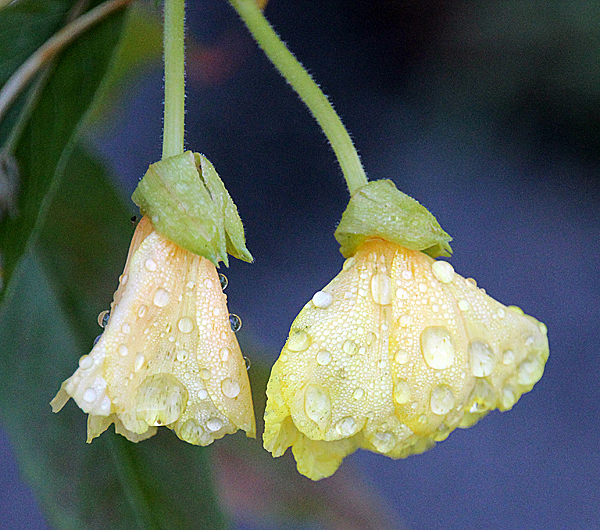 I am always fascinated with the beauty in raindrops on petals. 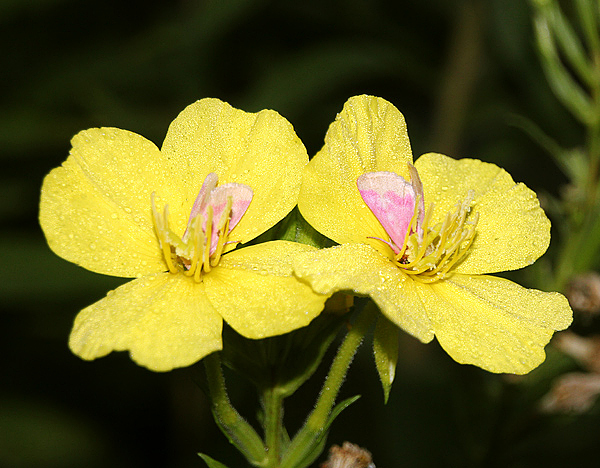 These two lovelies are Evening Primrose. Now that I've done a bit of ranting, I must get busy here and get dressed. Time is flying by, and we have to be leaving the house in about twenty minutes. So, till tomorrow, Y'all have a wonderful day. Good morning. 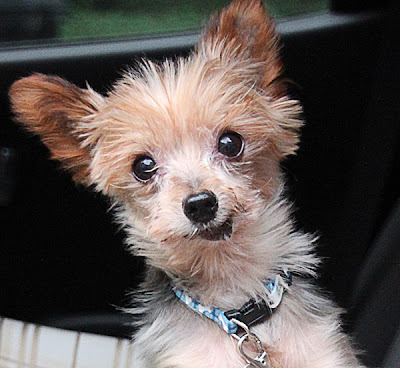 I sort of feel a bit guilty sitting here typing a post when my little Pogo is looking up at me with starvation in his eyes. Goodness, he knows how to make me feel guilty! Well, he's just going to have to wait a little longer for breakfast. The strangest thing happened on my way home from work this morning. I came to a set of railroad tracks, and the gates were part way down and the red lights were on. So I stopped and waited for the train. And waited. And waited. Meanwhile there was a line of cars behind me and a line of cars on the other side of the tracks. 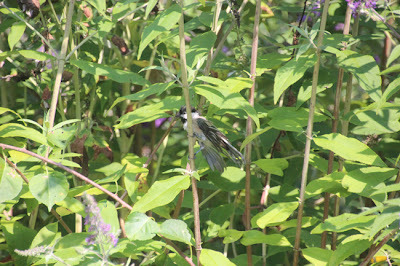 Finally, after creeping slowly up to the tracks, I hurried across and went on my way. I hope this gets fixed soon. It could be a rather dismal problem. Further up the road, I went through an intersection where some road workers were putting up orange cones in the road, closing all but two lanes. The oncoming traffic was only using one lane, so I went forward in the other lane, and all the cars behind me followed. A little way up, one of the workers stopped me to say that I could not go this way as he had just closed the road. However, I could not turn around. So, finally the man opened the road and let us all through. The best thing to do in a situation like this is to smile sweetly and act dumb. It works! 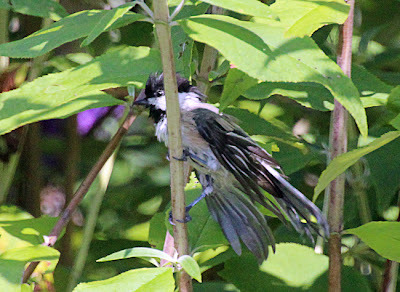 I also want to mention that the little bird in yesterday's photos was a chickadee. 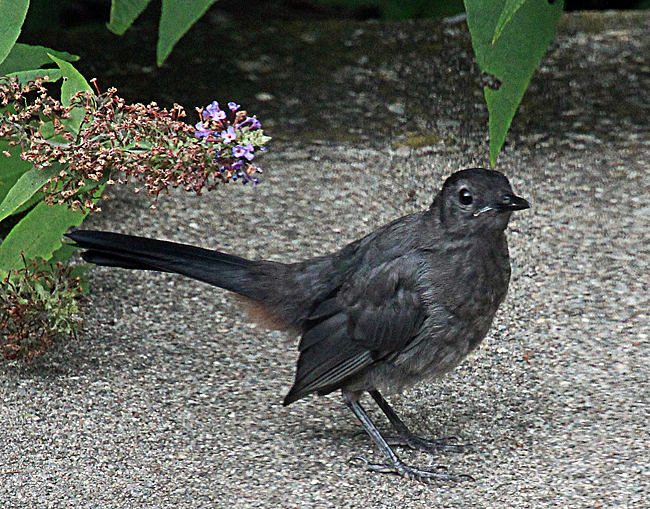 The way the feathers were ruffled could be a bit confusing, but that's what made the photo so special to me. This morning, I have another version of last Friday's photo art that I've done for Mandarin Orange Monday. 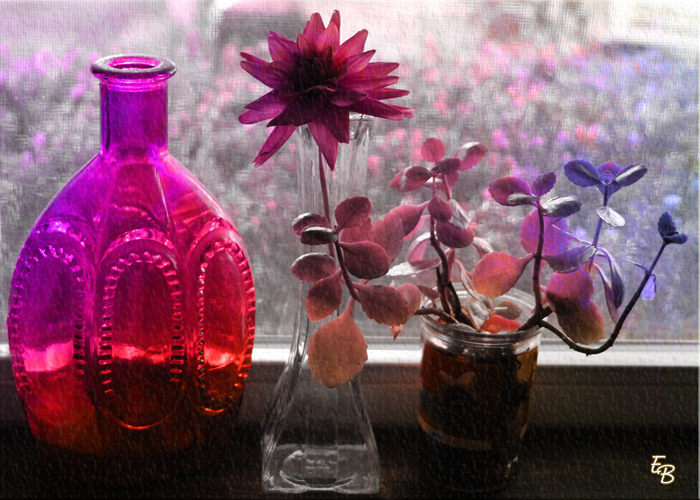 This time I used Bonnie's Dusty Rose Bokeh texture on the photo. The actual color of the bottle is dark orange. 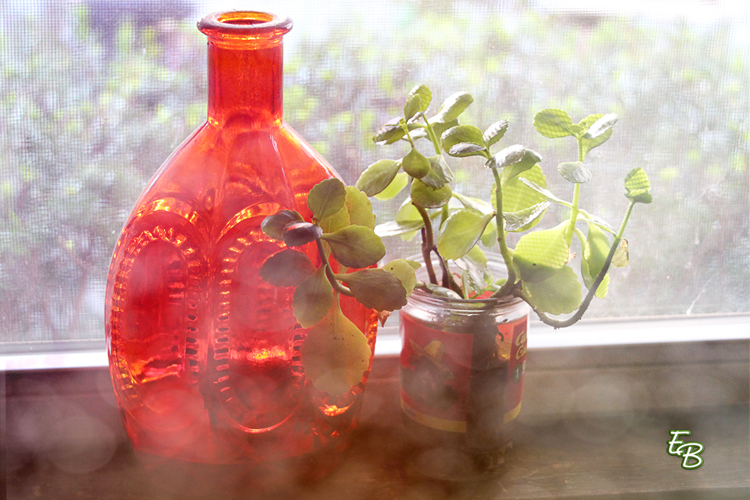 The little glass jar is a jelly jar. 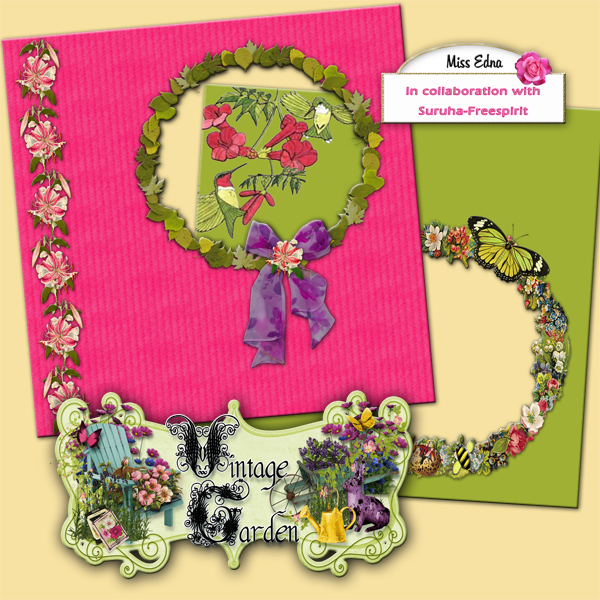 Today, Su and I are posting Parts 3 & 4 of our August collab kit "Vintage Garden". Here's my preview and your download links. When you've finished downloading, do stop by Su's web site and pick up her parts. If they're not already up, be patient and go back again later. I sometimes post early because I either post before I leave work to come home, or as soon as I get home. Here is Su's preview. Let me tell you, her parts are just chock full of goodies. Now I think I'd better head for the kitchen and whip up some breakfast before Pogo has my leg completely scratched off. He's been busy running back and forth between me and the refrigerator and then he comes to scratch my leg to get my attention. I'm guessing that maybe he's hungry. Good guess, huh? Okay, I'm gone. Till tomorrow, Y'all have a fabulous day. Good morning. Yesterday was not a very good day for me, and I did not even post here on my blog. I spent most of the day in bed, and only got up to tend to Pogo and later to go to work. This morning I'm feeling much better. The Mrs hasn't been doing so good either. They put her on a new medication several days ago, and she's been like a sleeping zombie (and very confused) ever since. So far, none of us knows what the medication is for, so I'll look it up later on the internet. I decided that I did not really like the photo art that I was going to post yesterday, and have scratched it. Maybe three a week is too much. Maybe I'll stick with two for a while. We'll see. I do have a fun photo to share. 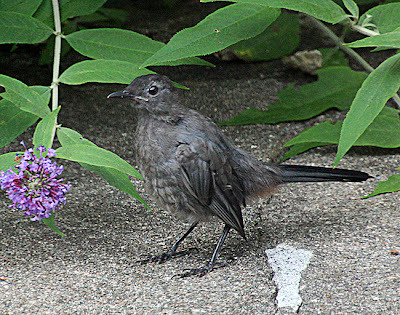 Last friday I was looking out the kitchen window (at work) and part of a bush was moving so I grabbed my camera and shot a few photos. I'm so glad that I did this because I really like the photo. I'll show you the original first, (I used a zoom to get a close shot) then a close up crop. I'll have to play with this photo, because I think I would like to hang it on my wall. There's just something about it that pleases me. I also took a photo last week of the Mrs' grapes. 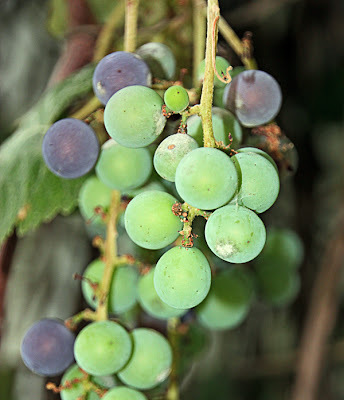 They have been turning purple, and the birds are so delighted. I think that's about all my news for this morning. Tonight is a work night, so maybe I'll do a bit of laundry today before I take my nap. Now I think I'll go and look up a couple of things on the internet before it's time to go home. Till tomorrow, Y'all have a fabulous day. Oh what a beautiful morning! It's going to be a scorcher later on but right now it is just gorgeous. Of course, I'm at work so there will be no going out to play today. I do want to look up a place called "The Butterfly Place". One of my co-workers took her family there for a day and she said "It's a must-see for anyone with a camera." The travel time is about an hour and a half each way, but she said it's worth it. I also want to check into pet health insurance. Had I done this with Tootsie when I first got her, it would have saved me thousands of dollars. This time around, I have learned my lesson. There will be no appointments with the doctors until the insurance is in place. Today I have a new piece of photo art to share. 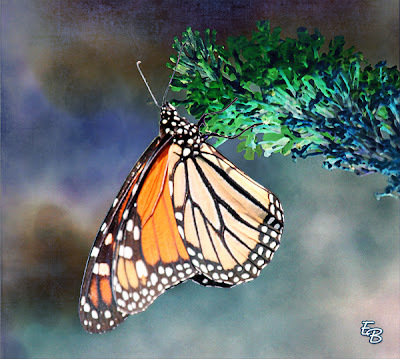 This one is for "Photo Art Friday" at Pixel Dust Photo Art. The theme for this week is "containers". I used Bonnie's (PDPA) texture overlay "Dusty Rose Bokeh" twice on this photo with a bit of Photoshop manipulation in between layers. 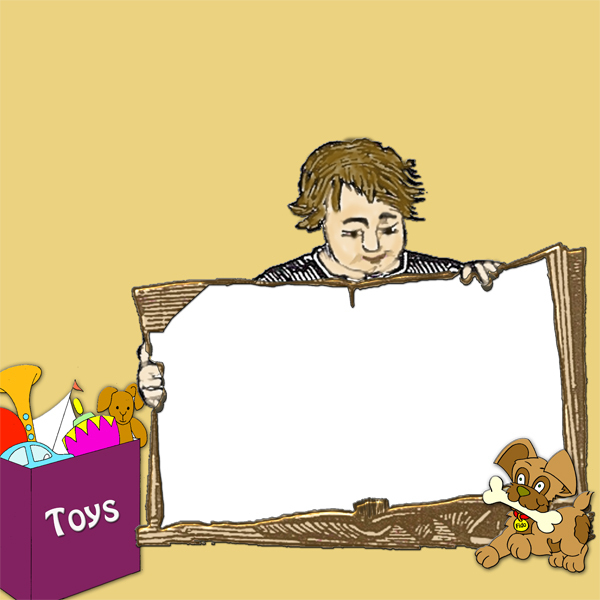 I also finished another piece of photo art for another forum but that will have to wait until tomorrow. I have to figure out how to get the photo uploaded to that site. Very late last night while Pogo was sound asleep, something woke him up with a nasty start (sort of like a bad dream), and it took more than an hour to get him settled down again. Gosh, I felt so bad for him. Whatever it was, it had him scared quite a lot. Well, that's all the news for this morning. The Mrs is calling, so it's time for me to get back to work. Till tomorrow, Y'all have a wonderful day. Well it's another soggy gray morning. Pogo and I went outside a while ago and it was still raining, but it's a light rain at the moment. Yesterday, we got a break from the rain for a few hours so I was able to get out to do my banking. Hopefully, today we'll get another break later this afternoon, and I can get some food shopping done. Well, rain or no rain, I still have to go because we are all out of dog food. When I went for my physical the other day, I told the doctor about being tired all the time. I should have kept my mouth shut. He started talking about sleep apnea, overnight sleep tests, and a mask to wear to bed at night. I told him I'd rather hold off on all this good stuff because the cooler temperatures that will be coming our way soon will definitely help my sleeping problem. He did tell me to get back on my cholesterol and high blood pressure meds. I didn't even bother to bring up about the vitamins. I'll just start taking my gummy vitamins and vitamin D again. I took all these things before I got the spider bite, but had to stop taking everything until the infection was all gone. It's still not gone, but it's not as bad as it was before. I think I'll survive. A few days ago, I ordered a few new sweatshirts for Pogo, and they arrived yesterday. I tried one of them on him, and oh gosh, he looks so cute! I'll have to take some photos of him wearing his new finery. 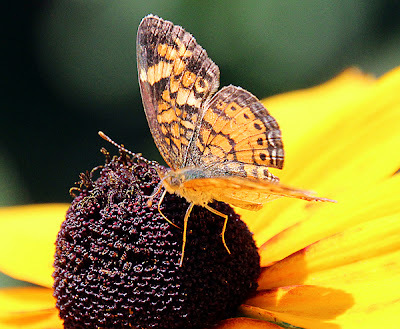 For photos today, I have a couple that I took at work the other day of a pretty little moth ( or tiny butterfly) on a black eyed susan. Seeing as how we got up really early this morning, I think maybe I'll try for a little nap after I finish my coffee. Hmmm, it sounds like a plan. On that note, I'll leave you till tomorrow. Y'all have a wonderful day. Good morning. It's rather gray outside and looking a bit like rain is on the way. Well, I suppose the lawns and gardens could use a good drink. My little guy Pogo is curled up next to me hoping for more hugs. What a smush bug he has become! I got an email with a copy of the annual state survey (done by the Massachusetts Department of Public Health) of the pediatric facility where my daughter Laura lives. For the eighth year in a row, the facility has been deficiency free and continues to receive a five-star rating. This puts Seven Hills Pediatric Center in the top 4% of the nation's skilled nursing facilities. This is fabulous news, but I already knew that the staff and care at this facility is excellent. If you must place your special youngster in a nursing facility, this is the place to check out. My Laura has lived at Seven Hills for more than thirty years, and the care she has received has always been top notch. Oh wow, I just took a short break to take Pogo out for a sprinkle before the rains came, and got quite a surprise. It's pouring! 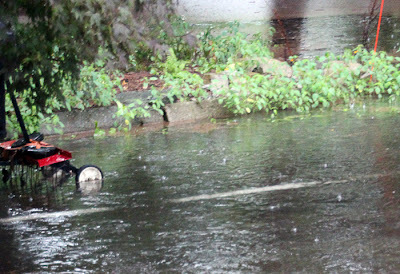 Poor little Pogo is not crazy about doing his potty business in the rain. And to be honest, I'm not crazy about it either. If only he would consider using the wee wee pads. Life could be so much easier! At the moment, it's getting much darker outside so I guess we're in for some thunder and lightning too. Hopefully, this will let up later this morning so that I can go out and get a couple of errands done. Last night I made a layout and QP for the "Paint The Barn challenge at Moo Two, using their color palette. Here's my layout and the QP with a download link. I hope you can use it. 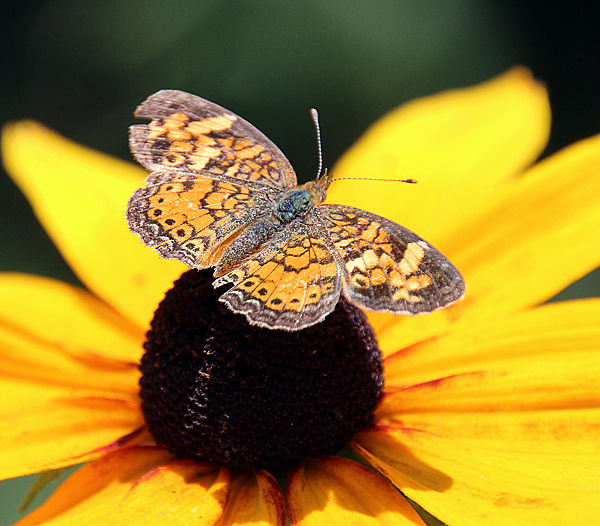 I thought I would also share the original photo that I used for last week's Friday Photo Art. I took this photo very early one morning last week at work. 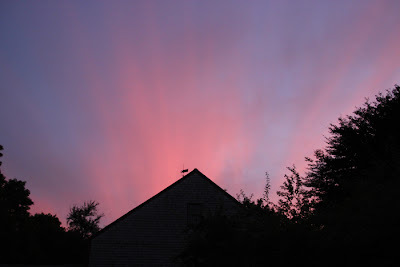 The sky was still dark blue, with huge rays of corally red. 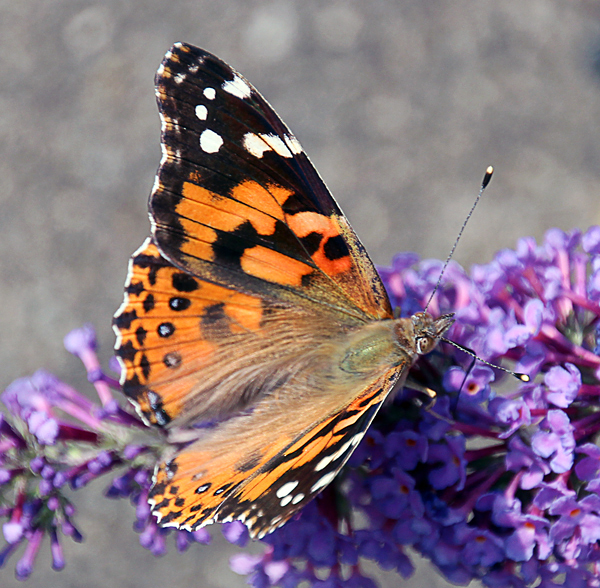 It was such a pretty picture that I just had to photograph it. Well, it's getting quite noisy outside. I haven't seen any lightning yet, but the thunder is very loud. I guess that's my cue to get off the computer for a while. So, till tomorrow, Y'all have a fabulous day. It's looking like a really nice morning so far. The sun is shining, and it's not too hot. This is good because I have a doctor appointment this morning. On the other hand, I don't have a babysitter for Pogo, so this could be a problem. I may have to leave him at home while I am gone. Hmmmm. There's really no news today. I think I need to get back on my vitamins though. I haven't been taking anything through all this problem with the spider bite, which is not yet completely healed. But now, I seem to be tired all the time, and accomplishing very little. My get up and go has done gone. Sometime this week, I have to rearrange my bedroom to fit in a piece of exercise equipment. This should be interesting, because I get tired just thinking about doing it. Yeah, I definitely need to get back on some vitamins. Although I do admit that I'm usually like this when the air is not so breathable. This should start getting better as we get closer to September and cooler temperatures. 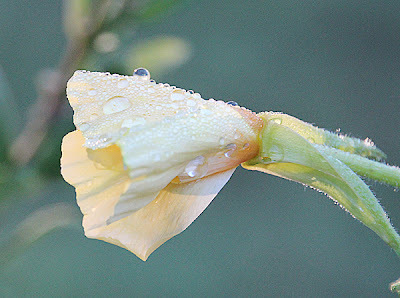 I have a couple photos to share of Evening Primrose. 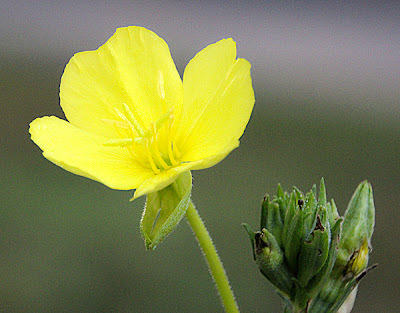 This is sometimes referred to as a wildflower or a weed. 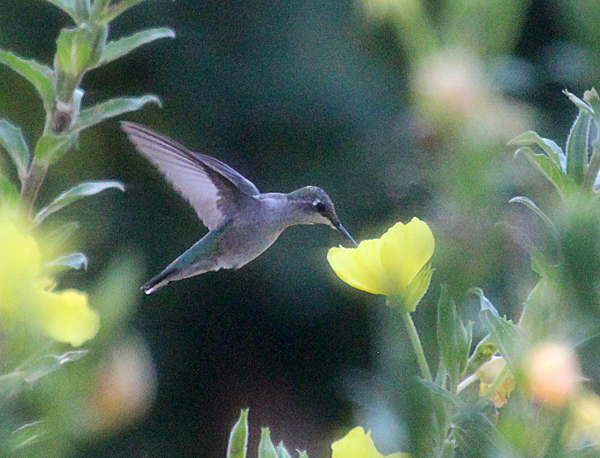 I think it's quite pretty, and the birds absolutely love it. These were taken on two different mornings. 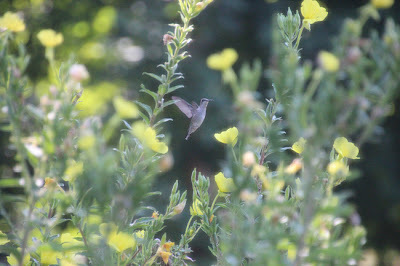 In the second photo, you can see two little pink moths that are feasting on the primrose. Well, that's it for this morning. It's time to get busy here and get ready for my appointment. Till tomorrow, Y'all have a fabulous day. Pogo Is Finally At Home! Good morming. It's a gorgeous morning here in my little part of New England. When I walked through the door this morning, Pogo came running across the floor to greet me. My goodness, such a greeting! 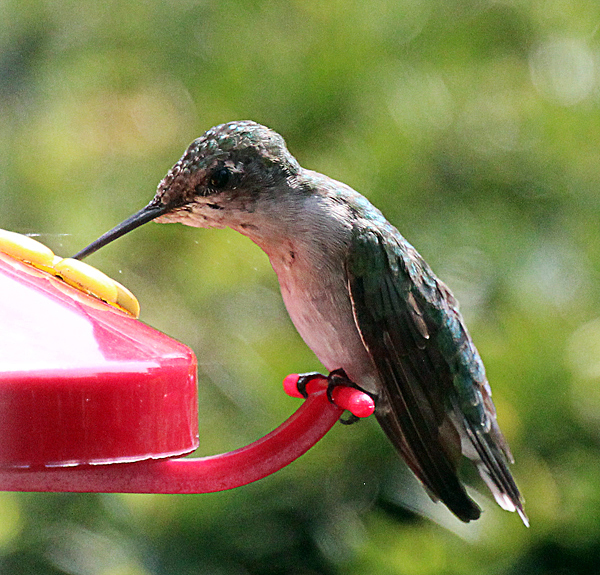 After breakfast, I took him outside for a sprinkle. When we got back into the house, this little guy decided it was play time. And boy oh boy, can he play when he gets wound up. It took almost half an hour for him to settle down. This morning, I have a new piece of photo art that I made for Mandarin Orange Monday. 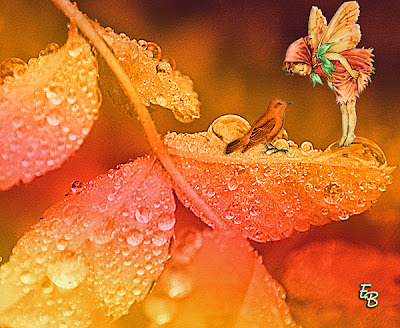 I got the fairy from Arthurs' Clipart, and the bird from The Graphics Fairy. The rest is mine. Seeing as how orange is my favorite color, I do enjoy this photo challenge. Well, the tax free weekend came and went, and I did not get a change to go shopping. I suppose things happen for a reason. I really don't need a new lounge chair. The one I have is very comfy, black leather and over stuffed. But it is made for a tall person like my hubby was. I'm barely over the five foot mark, so I don't fit so good in the chair. I'll just take my time and keep looking. Today, I'm posting Parts 1 & 2 of our August collab kit, "Vintage Garden". As usual, these are the quick pages. I hope you like them. When you have finished downloading, do stop by Su's website and pick up her parts. If they're not up yet, try again later. Don't forget to stop to say hello and thank you. That's all there is for news this morning. Now I think I'll make a cup of coffee and wait for Eddie to get here to fix my lights. Till tomorrow, Y'all have a marvelous day. Good afternoon. Wow, I slept good this morning. I got up earlier for Pogo, then went right back to bed. I surely needed the sleep though because lately it's been hard to come by. The weekend weather held up, and Deanne and Eddie and the kids had a wonderful time away. They got back around 9 o'clock last night and came by to pick up Sassy girl. 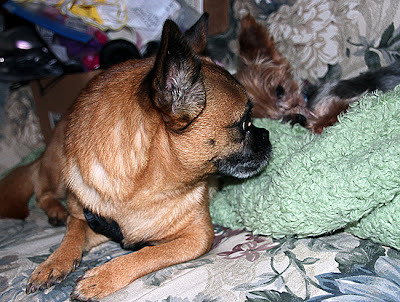 After that, the house got so quiet, (no barking) and my little guy kept looking for his playmate. We're going to have to do this from time to time. 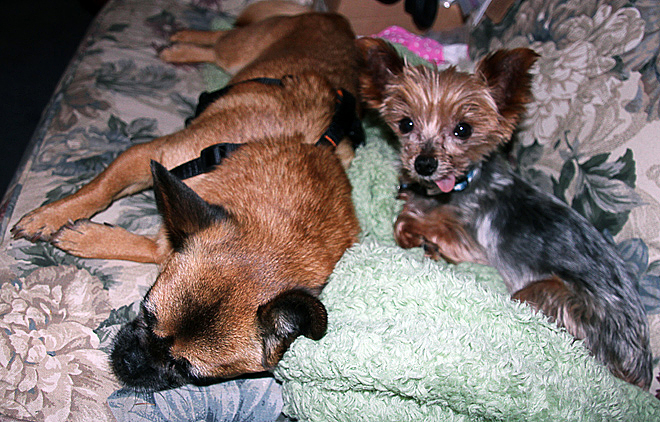 Once Pogo and Sassy decided it was more fun to play nice, they had a wonderful time together. And when they weren't playing, they were napping together. Did anyone see the light show last night, or rather early this morning? I did not get to see it, but I will try again tonight while I'm at work. Some of the photos that were shown on TV were fabulous. On TV, I also listened to a presidential spokesman telling us how the President is doing his best to figure out how to lessen and fix the problem of the extreme drought in this country. What the man did not say was exactly what is going to be done. We have areas that are flooded and yet, there is still nothing being done about transporting all that water to other parts of the country. I've been saying for years, and I'll say it again, we need a water pipeline system to transport water to drought areas. Folks, if you know a politician, please pass this idea on. And if you do get any feedback, please let me know. I won't hold my breath. Politicians don't seem to relish any ideas that that benefit someone other than themselves. Do any of you have Rose of Sharon bushes in your yards? Can you tell me something about it's blossoms? Mine was a very late bloomer, but once it got started, several blossoms open at the same time. But, after two days of blooming, the blossoms fall off to the ground. Is this normal? I never really had a reason to notice this before. There's not much news for today, so I'm off now to do some laundry. Till tomorrow, Y'all have a wonderful day. Two Doggies Are More Fun Than One! Good morning. I hope everyone got lots of sleep. You know I did not!! 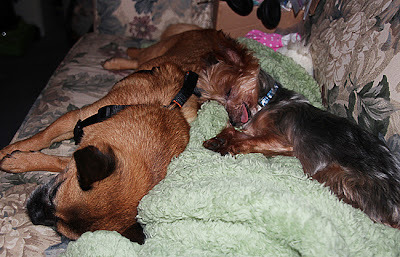 The Howling Hounds kept me busy cleaning sprinkles on the rugs and making potty trips outside. The last trip out was at 3:30 a.m.. When I tried to ignore her, Sassy would go out to the pantry and start barking. Groan, groan. What made me think I was going to get any sleep? These two little darlings spent the afternoon and evening barking at the slightest sound. When there was no sound, they barked anyway. I was good though, and left the Sam Adams in the refrigerator. To make matters worse, the rain finally came yesterday when Deanne was on her way over here to drop off Sassy. Next came the thunder and lightning. I thought for sure this might cause a problem with my furry charges, but they were pretty good through all of this. The difficult times came when the little ones would decide to go out for a sprinkle, and the rain was coming down at a hefty clip. The only one who got drenched was me. These two little darlings would not go out the door. And why should they when there was still plenty of carpet to sprinkle on! I spent a lot of time running after them with a roll of paper towels and a spray bottle of carpet refresher, and saying "Okay, who did it?" This is when both Sassy and Pogo would band together and give me that stupid "I don't know" look. By the time it was getting dark outside, the rain let up and I was able to take both of them outside. The rain was very light and on and off throughout the rest of the night. At the moment, both Sassy and Pogo are sound asleep on the sofa. Gosh, they look so adorable. I would take a photo, but the moment I move, they both hop up and run to the pantry for a bit of barking. I do have some photos of a pretty gray catbird that I took a couple of weeks ago at work. 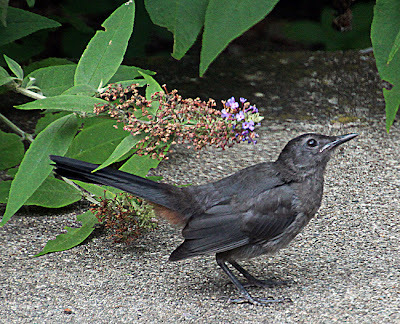 This little bird came out from under the butterfly bushes in the Mrs' backyard, so I'm thinking that maybe she had her nest in there. I took these photos through the kitchen window. Except for it's coloring, this bird looks very much like a robin. Now I think I'll wake these two furry kids and take them out. Who knows, maybe after that I can catch a few winks. On second thought, maybe I'll just lean back and try to catch some winks while they are still asleep. Shhhhhhh, don't wake them. Till tomorrow, Y'all have a wonderful day. A New Award, Thank You Thank You!